In the Pacific Ocean off the coast of California are a group of islands called the Channel Islands. These islands are 25 miles south of the city of Santa Barbara, separated from the California coast by the Santa Barbara channel. There are five main islands (San Miguel, Santa Rosa, Santa Cruz, Anacapa, and Santa Barbara), and many smaller islets. The waters of the Channel Islands are an important habitat for many marine creatures. The waters around the Channel Islands are an important national resource protected by the U.S. Channel Islands National Marine Sanctuary since September 1980. This sanctuary includes everything within seven miles of the coasts of these islands. The oceans are home to many species of whales and dolphins that migrate near these islands every year. The islands are an important breeding ground for seals and sea lions, who visit the islands beaches to raise their young, rest, and play. The sandy beaches are an important food source for many species of birds, as waves deposit tons of plankton into the sand to be eaten by insects that are then eaten by birds. The oceans are also home for immense forests of kelp. Kelp is an ocean plant that is an important food and habitat for many marine animals. For more information about the Channel Islands National Marine Sanctuary, use this ReefNews link to the National Marine Sanctuaries home page. The Channel Islands themselves are a national resource protected by the U.S. Channel Islands National Park. The Channel Islands National Park includes all five of the Channel Islands. Diana Reischel, an oceanographer for ReefNews in 1999, has visited and worked at the Channel Islands. She has documented many scenes and species with beautiful photographs. 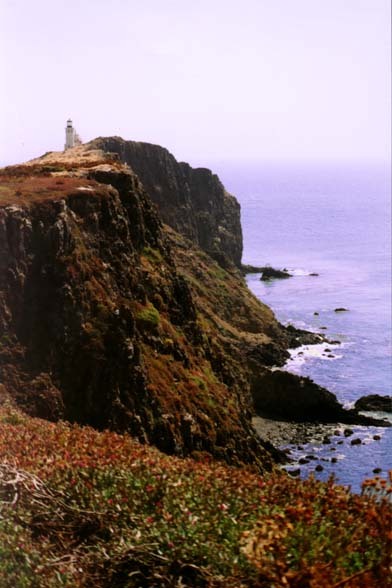 This photograph shows the lighthouse at the east end of Anacapa Island. Copyright © 1999, 2003 ReefNews, Inc.